Recently, while the residents of Charlotte, N.C., were trying to decide whether to name a new park after their most famous son, Billy Graham, the city’s newspaper ran some of the mail they have received on the subject. Most writers felt this is a fitting tribute to the world-famous evangelist; some didn’t want to go that far; but the final letter pulled me up short. "Graham and his God don’t deserve honor," wrote Paul Jamison. "He promotes a God who gets heinously violent (plagues, floods, a bloody sacrifice of his Son, threatens to destroy the earth and finally a torturous eternal punishment) for nonbelievers. So I say no to naming a peaceful city park after a believer of (sic) this raging God." It is true that false gods are generally gods people believe they can manipulate. But Yahweh, the LORD, is the true God whether we find Him repulsive or not. And no amount of anger or denial is going to change reality. The God of the Bible cannot be controlled by us. Main Idea: False religion is often an attempt to control the fears and uncertainties of life. But whether we approve of the way He runs the universe or not, only Yahweh is Sovereign. Where we have come from and are going in this series so far. Why these plagues were different. John J. Davis, in his book Moses and the Gods of Egypt suggest 5 distinctives of these plagues. Intensification: known plagues but worse than ever. Prediction: Moses predicted the moment of arrival and departure. Discrimination: distinction between the Hebrews and the Egyptians in the 4th, 5th, 7th, 9th, and 10th plagues (v. 8:23; 9:4, 6, 26; 10:23; 11:7). Orderliness (a progression of judgment in the plagues). Moral purpose (intended to teach a lesson). Could have been natural phenomenon specially controlled (like Jesus quelling the storm). Well over 80 gods, including the Pharaoh. Exodus 12:12, "On that same night I will pass through Egypt and strike down every firstborn--both men and animals--and I will bring judgment on all the gods of Egypt. I am the LORD." Why so many gods? Superstitions? Life is scary, and we want to get some sense of control. False religion is usually about controlling God, or God management. The pattern of the 10 plagues. The first nine and then the grand finale, the 10th. The first three: Aaron lifts up Moses rod. The middle three: God begins plague without Aaron or Moses. The last three: Moses lifts up his hands. Perhaps over a period of eight months (clues within the text). The First Series of Plagues. Water turned to blood (7:14-24). Language of appearance…may have been real blood, probably not. Each year, toward the end of June, when the waters of the Nile begin to rise, they are colored a dark red by the silt carried down from the headwaters. This continues for three months, until the waters begin to abate, but the water, meanwhile, is wholesome and drinkable. The miracle of 7:17-21 involved three elements by which it differed from the accustomed phenomenon: the water was changed by the smiting of Moses' rod; the water became undrinkable; and the condition lasted just seven days (v. 25). Egyptians could produce on a small scale. Some have suggested red silt with bacteria. 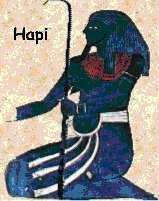 Secondary gods: Hapi, spirit of the Nile. Khnum, guardian of the Nile. Frog infestation (8:1-15) (7 days later). Egyptians could produce a few frogs. Why the natural explanation does not satisfy the text. Originally, only one (cf. 8:6, which should be translated, "frog."). Young's literal translation, "And Aaron stretcheth out his hand against the waters of Egypt, and the frog cometh up, and covereth the land of Egypt". “Men do not often learn the righteousness of God when he grants them his mercy and his favor” (Walter Kaiser) (Psalm 78:34-42; Isaiah 26:10). Constable, "The dust...became gnats" (v. 17) probably means that the gnats rose from the dust, resembled the dust in that they were so small, and were as numerous as the dust. Moses evidently used the language of appearance (here a metaphor). Magicians recognized this was not some superior conjuring. Exodus 8:19, "The magicians said to Pharaoh, 'This is the finger of God.' But Pharaoh's heart was hard and he would not listen, just as the LORD had said." God insulted: Geb, who was "god" of the earth or vegetation; father of Osiris and husband of Nut; also Aker, god of the earth. What Can We Learn from These Plagues? The righteous often experience judgment with the wicked in this life. Distinction between the Hebrews and the Egyptians in the 4th, 5th, 7th, 9th, and 10th plagues (v. 8:23; 9:4, 6, 26; 10:23; 11:7). We depend upon God for our daily survival. Turning the Nile to blood is a reminder of how vulnerable we human beings are; we require clean water to drink or we die. It doesn't matter if we build great monuments or are the most powerful nation on earth. We still must depend upon God for our most basic needs, like it or not, admit it or not. Additionally, the righteous are challenged by those who can duplicate the plagues. We must address many competing religions and philosophies, and it is not always easy. The magicians are examples of the world, false religion, and the wisdom of man; and it is amazing what they can do. God does things His way, not ours. Didn’t act for 400 years. Spread out the plagues for 8 months. For some of them, His people had to suffer with the Egyptians. He orchestrated events so that He would get the glory. God can make us miserable with the very things we put above Him. The Egyptians worshipped a frog god, so God made them miserable with frogs. The Egyptians worshipped the Nile, so God made the Nile detestable. The Pharaoh is typical of an obstinate sinner. He is confronted with God but has no interest. When he gets desperate, He acknowledges God but soon forgets Him. He thinks even God cannot control him. Romans 9:17-18 says, "For the Scripture says to Pharaoh: 'I raised you up for this very purpose, that I might display my power in you and that my name might be proclaimed in all the earth.' Therefore God has mercy on whom he wants to have mercy, and he hardens whom he wants to harden." Modern day example: Joseph Stalin, anti-Semitic, but allowed the formation of the nation of Israel when he could have vetoed it on the security council. Happened to be in a "high" mood and let it pass. Human nature has not changed; some of us reinvent God to make a controllable deity; others of us are hardened against Him; others are deceived by this world's magicians and wise men. But when God is good and ready to enter the contest, He always wins.